Xerox copies of Lost in Space episode scripts are readily available. Scripts can also be obtained for the unaired pilot "No Place to Hide" and the unfilmed 4th season episode "Malice in Wonderspace." Early drafts and revised scripts are also known to exist. The cost of one of these is usually somewhere between $10 - $15 per episode. From a collector's point of view, the most prized scripts are original scripts. With the exception of the covers, all original Lost in Space 20th Century Fox scripts were hand-typed. Copies of the orginal typed scripts were then xeroxed for cast and production staff. So how do you tell an original script from a recent xeroxed copy? There is no easy answer, but the following may help. All 20th Century Fox scripts for Irwin Allen shows basically followed the same format. Script covers would be made from thin two-ply colored cardboard. Two holes would be punched on the left hand edge with the pages held together by two bendable hole pins. This would make it easy to change script pages even at the last minute by simply substituting modified pages with new ones. If you have a script and it doesn't have these holes then you probably don't have an original. Note, in "Revised Shooting Final" scripts, the presence of modified pages was indicated by different colored pages. 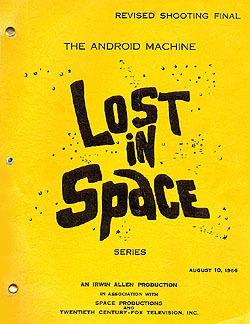 Script covers included the title of the episode in the form of a logo, the name of the series: Lost in Space, a date at the bottom right hand side, a script status ("Shooting Final" or "Revised Shooting Final") at the top right hand side and Irwin Allen production details at the center bottom. The first page of the script would normally be the title page. This page was hand typed and included all the information found on the covers with the addition of the script writer's name and a script reference number at the bottom right hand side. The reference number would then be repeated on every page of the script. In "Revised Shooting Final" scripts, a page usually at the beginning of a set of modified pages would alert 20th Century secretaries to special instructions regarding the insertion and removal of pages. When buying a script it's worth remembering that not just the main Lost in Space cast had them. Numerous production staff, guest cast and cast doubles had them as well. So while original scripts can be considered rare, they are not as rare as you might think. Naturally, the most prized scripts would be those that are signed by the main cast or early annotated versions belonging to a script writer. Regrettably the latter rarely come on the market and your best bet to find one would be entertainment related auctions held by larger auction houses such as Butterfield & Butterfield, Southeby's and Christies. 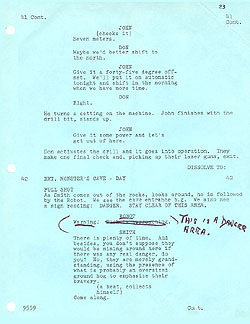 The script shown on this page is the final revised shooting script of the 2nd Season episode "The Android Machine" and is one of several scripts originally belonging to Bob May (the man inside the robot) but now in private hands. Bob's handwritten annotations and markings can clearly be seen. It was normal practice for Bob to mark up the robot dialogue in round brackets and also to note last minute script additions, amendments and deletions. The pages with Robot dialogue frequently had their corners folded down. Bob also tended to underline each syllable of long or difficult to pronounce words. Another common feature is a vertical fold across the middle suggesting that Bob actually had the scripts at hand while inside the Robot costume. The fact that the stiff cardboard covers of his scripts generally don't have the same folds seems to confirm this view. Bob probably removed the covers as they were most likely cumbersome inside the costume.